Kulfiholic, The Mumbai Social. These are actually two restaurants in one. It was a mystery to me as to why would they name it Kulfiholic when they serve so much more. 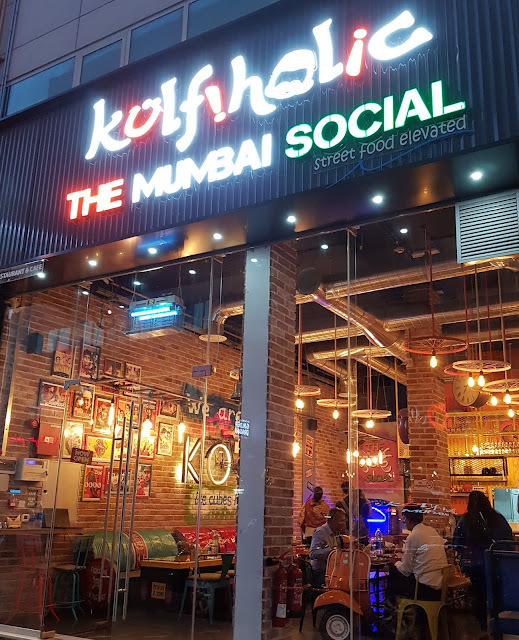 That's when I came to know that the Kulfiholic is the kulfi part of it and "The Mumbai Social" is a concept which serves Mumbai street food. As soon as you enter (or even from the outside actually), you'll see that they've given a very Mumbai-street-like feel to it. They've also incorporated the ambience of a local train. The walls are filled with very well known sayings / quotations that every Mumbaite can relate to. 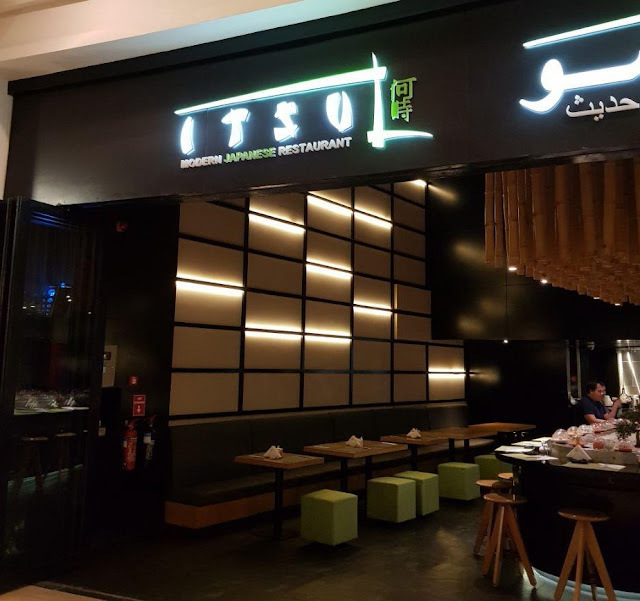 For the month of Ramadan, they have an Iftar set menu for just AED 41. This one includes one starter, one main course, one fresh lime soda, and one kulfi. We were two bloggers and were invited to try out the dishes here. Most of the items that we had were from the Iftar menu, but there were a couple of them which weren't in the menu too. 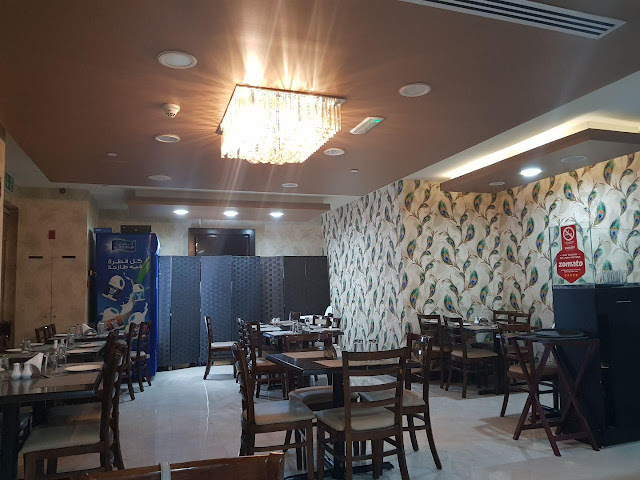 This is a small place located in Al Khan, but the food is pretty good and they had invited me to try it out. I was surprised to know that this place also has momos. We had the chicken momos in schezwan sauce. These were really delicious. They were served piping hot, and with ample of schezwan sauce which made it taste even better. As for the kati rolls, we tried the chicken kati. This was definitely good, but considering this is their speciality, I was expecting more from it. The roti in which it was wrapped seemed a bit undercooked, but apparently that's how it is supposed to be because if it is well cooked, then it would make it hard to wrap it. For the mains, we had the chicken kolhapuri. It is a dish that is on the spicier side, and has really good flavours. The quantity of this one was also very good. We had this with the butter roti. There are a lot of sushi places coming up and each one seems to be a bit different than the other. This place had interesting combinations, that also had some catchy names, and they invited me to try these out. I like the colour scheme that they've used in the restaurant. It is green, black, and brown. The green really stands out as compared to most other places. As soon as you enter, you'll notice the sushi train (conveyor belt sushi), and for sushi & sashimi lovers, there's a good news. You can sit there and have unlimited quanitites of this for just AED 111 (+ vat)! We chose one of the tables on the side instead; a more comfortable one. I found the name of this place really catchy. It feels really desi. They're located in JLT, and invited me to try out their food. This place serves Indian cuisine as well as desi Chinese. The menu is huge and there are a lot of things to choose from. We started with some drinks which were really refreshing - the fresh lime water and the jal jeera. Served at the right temperature and had the right amount of tanginess to it. We ordered one of their Chinese starters - the salt & pepper prawn. This dish also had some garlic in it which we really liked. The prawns tasted great, and the salt & pepper sauce was so good that I could lick it off my plate. If you like spicy food as well as garlic, you're sure to love this. In order to try more of their starters, we called for a non-vegetarian platter. It was modified a little bit and they put the chicken tandoori and the aatish-e-chicken in there. 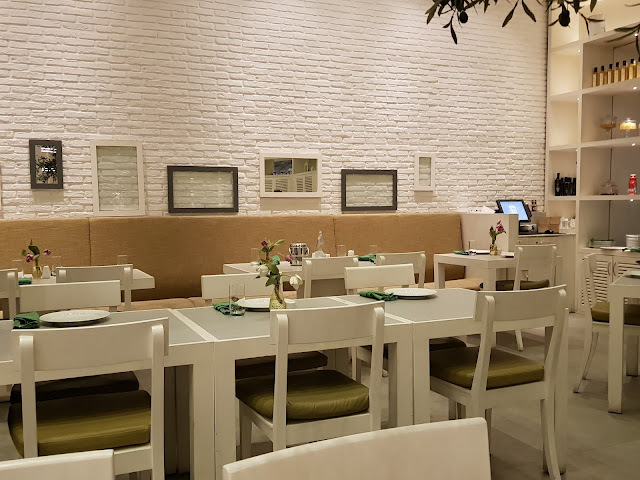 This is an authentic Italian restaurant in old city walk. Not only the food, but even the look and feel of this place is Italian. During Ramadan, they're having the "La Familia" iftar and they invited my to try it out. The Iftar is for AED 149, and includes a very tempting spread of antipasti, a selection of Nepolitan Pizzas, a selection of Risotto and Pasta, a daily chef's creation of main course, and desserts. Among the antipasti, do not miss out on the Parmesan cheese wheel, that will leave you wanting for more. In general, this place is a haven for cheese lovers. There also the Burrata which is one of the best that I've had. The calamari was crispy and really good. Worth a try for sea-food lovers. The lasagne was really flavourful. It wasn't too lumpy lumpy or dry like many places, but made really well.